Be it a wedding, a birthday party or a company event: we are happy to organise your function on our premises. We welcome groups from 10 up to 280 people, and kindly ask you to reserve in advance, as Hotel Hecht does not accommodate a public restaurant. Would you like to dine à la carte in elegant surroundings? We are happy to reserve a table for you in our partner hotel, Romantik Hotel Säntis, where a plentiful choice of dishes awaits you. Our two spacious and bright ballrooms ‘Fähnern’ and ‘Kamor’ can be used separately or in combination. Used independently, they offer space for up to 80 and 120 people respectively. 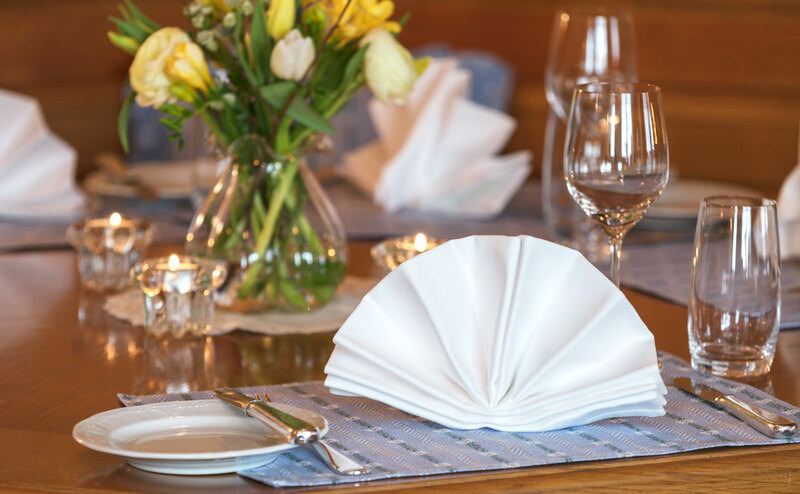 The homely atmosphere of the ‘Alpsteinstube’ is ideal for smaller functions of up to 40 people. Additionally, the ‘Alpsteinstube’ can be connected to ‘Kamor,’ thereby providing an even larger space. When all rooms are conjoined, the first floor therefore offers space for up to 280 guests. Would you like to hold your function at Hotel Hecht? Reservations are only effective once confirmation from Hotel Hecht has been received.